GOVERNMENT has set out a clear vision for youths to have decent jobs and to benefit from broad-based empowerment initiatives that will move them out of poverty, the President has said. President Mnangagwa also warned those who perpetrate child abuse, saying the law would take its course against offenders. Addressing a children’s party he hosted together with the First Lady on the eve of the country’s 38th independence anniversary in Harare yesterday, the President said his Government had set a target for a middle income economy by 2030. “The future that lies ahead is promising. 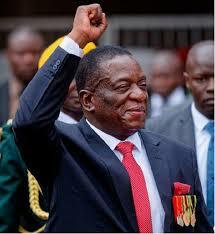 As Government, we have set out a vision to create a Zimbabwe for you which is a middle income country characterised by increased investments, decent jobs, broad-based empowerment, free from poverty and corruption by 2030,” President Mnangagwa said. “We are persuaded that if parents and guardians have decent lives, it is passed on to you the children and will translate to a better standard of living and decent future for you. Thus my Government is committed to holistically address the various matters that affect and impact on your lives and well being,” he said. Since coming to the helm of Government last year, President Mnangagwa has enunciated policies aimed at attracting investment into the country and increasing employment opportunities. President Mnangagwa said Government had built a lot of schools since the country attained independence in 1980. “The last 38 years have witnessed an unparalleled increase in the establishment of schools which has equally resulted in increased number of learners. “Going forward, the provision of quality and relevant education will be a key priority area of Government in order to lay a firm foundation for the development of an appropriately skilled human resource base for the socio-economic requirements of our country,” he added. President Mnangagwa pledged to continue providing resources to schools adding the new curriculum was crafted to cater for every child. “The updated competence-based curriculum has a broad range of content so that every learner can find a learning area that suits his or her best talents. Our goal as Government is to ensure that the updated curriculum supports and sustains the transition from school to the field of work,” he said. He challenged the children to be inquisitive, innovative and analytical as the world was fast changing and needed people that were astute and creative. “Technology is an integral component of development. I call on you to use ICT primarily for study and research purposes. Do not allow the internet to defile, corrupt and erode your cultural values, as well as your family and national identity,” he said. President Mnangagwa hit out at child sexual abuse and urged parents and guardians to exercise collective responsibility to protect their children. “Children must be protected from domestic violence and all forms of child abuse. They should also be educated and conscientised about the nature and different forms of abuse,” he said. “Boys and girls must report any form of abuse to any adult they trust or to the police, regardless the perpetrator. Government on its part will enforce the laws and measures that protect them. Let me sternly warn would-be offenders that child abuse will be punished without fear or favour of one’s status or social standing,” said President Mnangagwa.